ALEXANDRIA, Va., Feb. 7, 2018 /PRNewswire/ -- U-Haul is pleased to announce that U-Haul Moving & Storage of Alexandria at 6910 Richmond Hwy. is bringing North America's most advanced car-sharing service to the residential hub south of Washington, D.C. The arrival of UhaulCarShare provides Alexandria residents with a sustainable transportation option. In one cost-effective package, UhaulCarShare gives members the freedom to use a car without the financial burden of owning a car. With guaranteed lowest pricing, the Ford® C-Max can be reserved for $4.95 per hour (plus mileage) or $68 per day. For those who need to drive longer distances, UhaulCarShare offers a capped rate which includes 180 free miles. The community-shared vehicle is available 24/7. To reserve the vehicle, make a reservation at uhaulcarshare.com. Fifteen minutes prior to your reservation, upload a photo of your driver's license and a selfie for U-Haul live verify agents to approve. When it's time to pick up the car, simply enter the key code to the lock box and go. "There are a ton of residences and apartments in this neighborhood, and we want to offer these folks a new option for transportation," said Amanda Kirsch, U-Haul Company of Metro DC president. "Many of our neighbors rely on public transportation and I know firsthand the Metro (rail and bus system) doesn't go everywhere. UhaulCarShare will give eople some freedom." Contact U-Haul Moving & Storage of Alexandria at (703) 360-1250 or reserve the Ford C-Max at any time. Hours of operation at the showroom are 9 a.m.-5 p.m. Monday-Saturday and 10 a.m.-2 p.m. Sunday. Reserve equipment at uhaul.com or contact Reservations at 1-800-GO-UHAUL. 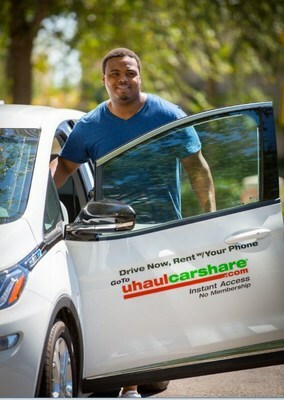 An eco-friendly form of transportation, every UhaulCarShare vehicle serves to replace up to 20 personally-owned vehicles, reducing congestion and improving air quality. UhaulCarShare is growing with more than 40 locations and 86 vehicles currently serving U.S. communities. "UhaulCarShare is a one-stop shop that includes insurance, gas, maintenance, a reserved parking spot and 24/7 roadside assistance. It's all offered within the rate structure," said Carly Castillo, UhaulCarShare program manager. "Something that makes us different from other car sharing companies is the instant access provided with our live verification. You do not have to wait to receive a key card in the mail and our agents are available to approve drivers 24/7." U-Haul Moving & Storage of Alexandria offers moving supplies in addition to UhaulCarShare. Future plans call for truck and trailer sharing, towing equipment, professional hitch installation, climate-controlled self-storage, U-Box portable moving and storage containers, and more. The acquisition of the 87,917-square-foot facility was driven by U-Haul Company's Corporate Sustainability initiatives: U-Haul supports infill developments to help local communities lower their carbon footprint. Our adaptive reuse of existing buildings reduces the amount of energy and resources required for new-building materials and helps cities reduce their unwanted inventory of unused buildings.